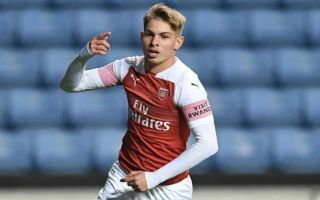 Emile Smith-Rowe could be gearing up for his Arsenal bow against Vorskla in the Europa League at the Emirates on Thursday night. The 19-year-old impressed new manager Unai Emery in pre-season and was the talk of North London after scoring against Atletico Madrid in one of the team’s friendlies, underlining his talent with a superb long-range strike. The English starlet currently plays in the youth set-up as a key member of the U-23’s squad at Arsenal and already has two goals to his name at the start of the new Premier League 2 campaign. According to the Daily Star, Smith-Rowe might have earned himself a place in the Gunner’s opening Europa League match this week, as he was reportedly left out of the club’s latest U-23 clash against Blackburn Rovers. The attacking midfielder signed a fresh long-term deal at the Emirates over the summer – as per The Daily Star – and it seems his loyalty might be about to pay-off, with Arsenal looking to continue their current hot-streak having won their last three matches in succession. Emery’s men finished 6th in the Premier League last season under Arsene Wenger during his last year at the club, for the second season in a row and thusly missed out on a place in the Champions League once again. As a result, Arsenal have to make do with another appearance in Europe’s second most prestigious competition this year and they have been drawn against Vorskla, Qarabag and Sporting Lison in Group E in the latest edition of the tournament. It is highly likely that with fixtures piling up fast over the coming weeks, Emery will look to the Europea League as the perfect opportunity to blood the youngsters he has at his disposal, which will surely be great news for supporters hoping to see English talent getting their chance to shine. Smith-Rowe certainly falls into that category and if he does indeed feature in some way on Thursday evening, the club could witness the dawn of a new hero as the Spanish boss continues his revolution at the Emirates.